Goodbye is one of the biggest wastes in the history of rock. Cream had a contractual obligation and were breaking up. Because of that they did a last album. They each agreed to write a final song and put it on the album. They still did not have enough material so the record company added three live tracks. Eric Clapton did "Badge" which he plays in concert to this day. Well 6 tracks just isn't enough, I understand they didn't work on the album as much because they were breaking up at the time. But by now that album should have more tracks if they included Live versions of classics because they didn't have enough tracks they should've include a lot more or other bonus tracks (like outtakes, instrumentals). 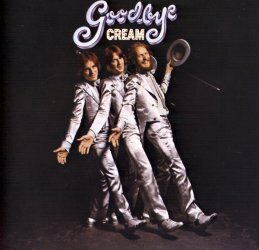 When people talk about Cream, this album is usually, and unfairly, overlooked, with Disraeli Gears and Wheels of Fire being recommended. Whilst both of these are incredible albums, in my opinion, Goodbye is more interesting. The album was originally intended to be a double, one studio disc, one live, in an attempt to recapture the success of WOF. In the end, a lack of studio material due to the busy touring schedule and their increasingly strained relationships meant that only three studio tracks were cut, hence a single album. The album kicks off with the live tracks from the L.A. Forum on their Farewell tour. "I'm So Glad" is the first track, and it's a cracker. They're really cooking on this one, despite, or because of, their relationships. It obliterates the version from Fresh Cream, with a much higher tempo and a jam section long enough to satisfy the crowd, and me, but short enough to keep it interesting. Politician is next and it's also good. Powerful and mischievous with accurate and concise soloing; none of the waffle and lack of ideas that ruins Steppin' Out from Live Cream Volume 2. The live portion ends with what is, in my opinion, the greatest piece of live Cream that I have heard, Sittin' On Top Of The World. Slowed down slightly from WOF, this is the best playing you will ever hear from Eric! Perhaps the reason it's so great is it leaves you wanting more, unlike the long jams found elsewhere in the Cream catalogue. Cream might have enjoyed the long jams and improvisations, but I think that they were at their most devastating when they kept it short; Crossroads anyone? The album then segues into the studio tracks. Badge is a great track, a classic if you will, but suffers from over-familiarity, but who cares?! I mentioned earlier that this album was more interesting than Creams other stuff; that's because their sound on this album is so different, and shows what sort of direction they might have taken had they stayed together... Swirling guitars through Leslie cabinets, more piano from Jack Bruce, and no faux-blues lyrics in sight. What A Bringdown is a Beatlesesque song which fits well with George Harrisons contribution on Badge. Whatever your opinion of Ginger Bakers songs, What A Bringdown is great, and perhaps the best studio cut of the three. Like I said, it's a very interesting album with great live Cream and some brilliant studio tracks. Essential!